Smoking #8 Orange Rolling Papers are 37mm by 70mm (single wide), medium pulp paper that is free burning, meaning it will burn at a medium rate. Good rolling paper for those who do not want their smoke slow or do not like it going out when they put it down. 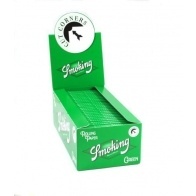 Even burning, natural rolling paper and gum with 60 leaves per package. Pull and stick tab on the back for attaching the pack to your tobacco pouch.